It’s that time of year where we are justified to make virtually anything into heart-shapes of all colors and sizes. With Valentine’s Day around the corner, this is the perfect opportunity to create fun and flavorful ways for your kiddos to get more nutrient-dense foods. If you’re a busy mama like me, you likely want to put a special touch on things for your kiddos to make holidays, like Valentine’s Day, memorable. The good news is that you don’t have to go to great lengths, spend a lot of money, or even be super crafty to do so (hello Pinterest-fails!). Here are some easy ways to get inspired in your Valentine’s kitchen to create healthy snacks for you and your kids. More importantly, enjoy the time spent with your kids - and your presence with them is what will make the memories special. The great thing about these snack options is how quick and easy it is to put them together. Most of these ideas will use wholesome ingredients that you already have on hand. All you need is a heart shaped cookie cutter set to transform these everyday foods to fit your Valentine’s themed. Kids love eating foods that are different shapes or that they can interact with, with things like dips, which is why these simple recipes are a hit. Wash and dry strawberries. Remove top green stems and slice strawberries in half. Dip strawberry halves in greek yogurt and place on baking sheet. Put baking sheet in freezer for 1-2 hours until yogurt is frozen. Do kids love anything better than dunking heart-shaped fruit in dip? This snack is so simple yet fun and delicious at the same time. I like using watermelon and strawberries to keep with the Valentine’s theme, but feel free to use whatever fruit you have on hand. Did you know that watermelon is a rich source of lycopene, which is an antioxidant that can naturally boost immunity? Prepare fruit by slicing into 1 inch thick pieces. Using the smaller heart cookie cutter, cut heart shapes into fruit slices. Assemble kabobs by threading fruit through the skewers. Serve on a plate alongside vanilla yogurt for dipping. These simple “sandwiches” use apple slices instead of bread for a spin on a traditional peanut butter sandwich. Use whatever nut butter you have on hand, like almond, peanut, etc. You can also let your kids customize their own sandwich by adding toppings of their choice on the nut butter, like chocolate chips or granola. Yum! Using a heart cookie cutter, cut out heart shapes from your apple slices. Layer 1 heart apple slice with nut butter and toppings of choice. Top with another heart apple slice. Beets are one of those vegetables that tend to get overlooked. But these veggies are packed full of heart-healthy folate, vitamin C, and fiber to add a nutrient boost to any smoothie. Many grocery stores sell beets that have already been cooked, peeled and chopped to cut out the prep work for you. This recipe works especially well for kids who have a hard time eating vegetables. In combination with the raspberries, the beets create a beautiful smoothie that is equal parts colorful and tasty! Add all ingredients to a blender, minus your ice. Blend until smooth. Add in ice. Blend again until well incorporated. You can’t go wrong with these delicious frozen yogurt “bars” that come together easily with your favorite ingredients. I prefer to use whole-milk greek yogurt for a creamier texture and higher protein content. For the mix-ins, I love using sliced strawberries, crushed pistachios, and chocolate chip bits to create a perfect combination of salty and sweet. You can customize this to whatever you have on hand that your family loves! Add yogurt to a mixing bowl. Stir in strawberries, pistachios, and chocolate chips. Mix until well-combined. Spread yogurt mixture on prepared baking sheet to create a rectangle. Freeze for 2-3 hours or until firm. To serve, slice into “bars” and enjoy! 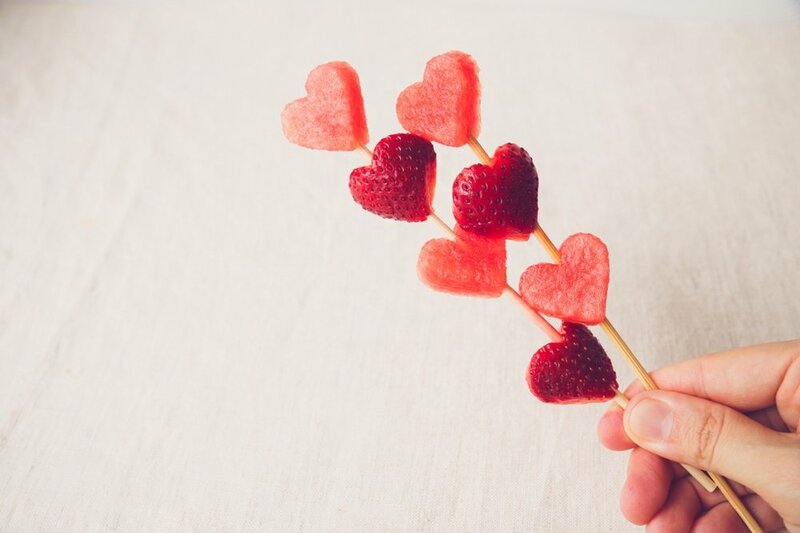 Now all that remains is which snack idea will you try this year with you kids for Valentine’s Day? Have fun, spread the love, and enjoy!